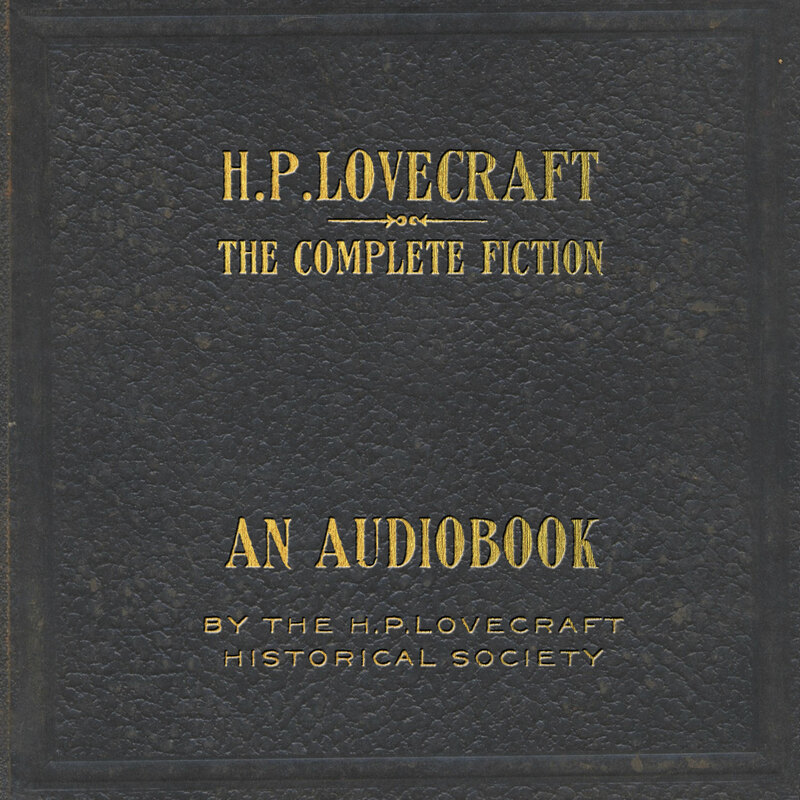 The HPLHS is pleased to present the first original audiobook of Lovecraft’s complete fiction, covering 74 stories and comprising more than fifty hours of professionally recorded audio. The stories are read by HPLHS founders and trained actors Sean Branney and Andrew Leman, from texts prepared by Lovecraft scholar S.T. Joshi. The recordings feature original music by Troy Sterling Nies. Three years in the making, this collection gathers all Lovecraft's tales, from those written in his youth to those written shortly before his death, in one comprehensive and unified collection. The Complete Fiction of H.P. 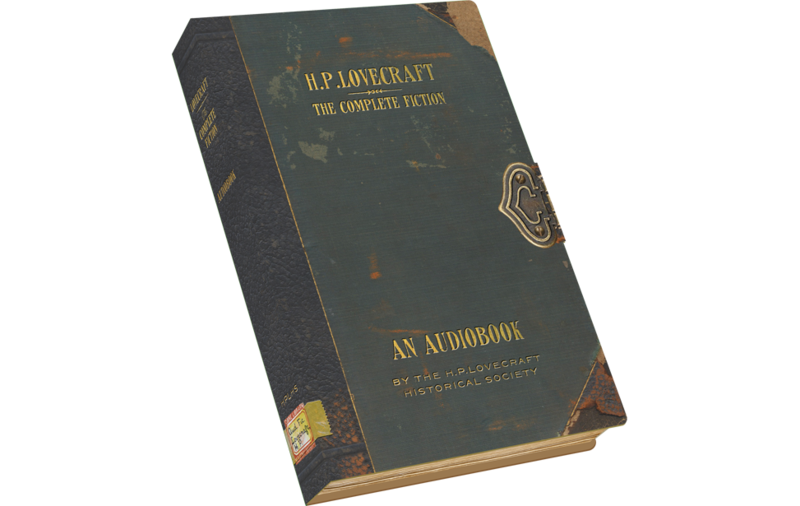 Lovecraft Audiobook is available in a Collector’s Edition featuring a faux old library book which holds a custom-made 16GB memory stick containing all of the stories as individual files. Download editions of the Complete Fiction as well as a subset of Collected Tales are available through the HPLHS’s online store. NOTE: The final chapter of the chaptered version of "The Dunwich Horror" was omitted from the chapters folder on some of the thumb drives in the first wave. If you are missing that chapter, you can find it for free here. Below are samples of the audio in the collection. We're pleased to offer the complete reading of "The Statement of Randolph Carter", along with brief clips of some of the other stories. A traditional book is a self-contained random access device: you can open it to any page you want and just start reading. But for an audiobook which might get played on a computer or a car stereo or an iPod or wherever with varying degrees of control, and for those who might not be familiar with all of these stories, we wanted to provide some suggestions for ways to approach this large collection. 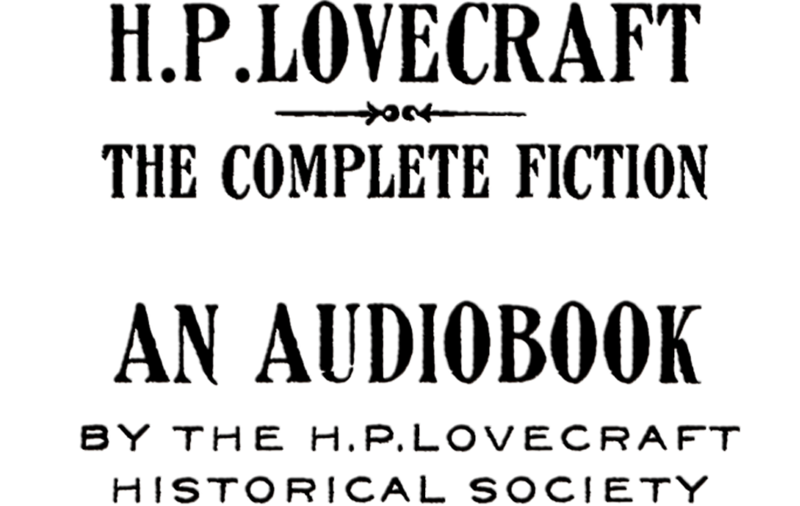 In preparing Lovecraft’s stories for this audiobook, we had to put them in some kind of order. If you start chronologically, then the first story you’ll hear is “The Little Glass Bottle”, which was written by Lovecraft when he was a seven-year-old boy. If you start alphabetically, then the first one you’ll hear is “The Alchemist” — a minor work — followed immediately by his epic masterpiece "At the Mountains of Madness", which we didn't think made for the best listening experience. But any other organizational scheme is entirely subjective, and after discussing various options we decided the best choice was to put the files in alphabetical order, but provide some suggestions for other ways to hear them. If you’re already familiar with Lovecraft’s works, we suggest you simply dive in and start listening to some of your favorite stories. If you’re new to Lovecraft, we suggest you start with our GREATEST HITS LIST in the tab to the right — once you’ve heard those stories, you can explore the rest of them on your own. We have some other suggestions in other tabs here. 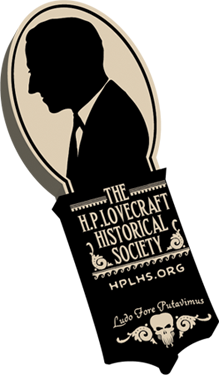 If you’re academically inclined and want to hear the development of HPL as an author, this Chronological List can be an interesting way to approach the stories. We’ve broken the stories into a few groups based on common settings or themes. There are stories set in the Dreamlands. There are stories that directly feature the “Cthulhu Mythos”. There are stories that are very science oriented, and some that are classic tales of horror. And there are a number of miscellaneous, juvenile, or shorter tales that don’t really fit any of these categories, all of which have a certain amount of overlap. In addition to the stories, we have provided a brief audio Foreword and a file of Outtakes (listeners offended by mispronunciations and salty language might want to skip this one). There is also a Listening Guide/Read Me PDF file. We largely went with Mr. Joshi’s determination as to the contents of this collection. These are stories written just by HPL himself, with the exceptions of “Under the Pyramids” and “Through the Gates of the Silver Key”. The famed magician Harry Houdini gets a minor credit for “Under the Pyramids” as the general concept was his, but the writing of the story itself was left to Lovecraft. E. Hoffman Price also gets a minor credit for “Through the Gates of the Silver Key”. Price wrote a 6,000 word draft of the story and sent it to Lovecraft, who then expanded the story to some 14,000 words, out of which Price estimated that only about 50 were words from his original draft. We’ve also included “The Very Old Folk” which is arguably not a story. Lovecraft had a very vivid dream set in Roman times and he described the dream in letters to several of his friends, elaborating more and more each time he wrote it out. The final version that he sent to Donald Wandrei is more of a story than a letter. We’ve included it as it is not typically included in collections of Lovecraft’s fiction — we thought fans might enjoy hearing it. Interestingly, “History of the Necronomicon” is included in most complete collections of Lovecraft stories despite the fact that it is not a story in a traditional sense. We have not included the many collaborations that Lovecraft worked on with other authors. And, of course, Lovecraft’s fiction represents only a small portion of his work as a writer. He was one of America’s most prolific epistolarians, having penned tens of thousands of letters. He also wrote essays, poetry and other types of non-fiction. How long did it take you guys to record this? But how long did it take to record? In terms of hours? Probably around 120 hours of actual studio time. And the edit was probably that much again, maybe a little more. It would have been less if Leman knew how to pronounce “basalt”. Does this collection include "The Mound" or my other favorite collaboration? It didn’t seem necessary to have one, as such. Each story is its own separate MP3 file, arranged alphabetically on the thumb drive. For longer stories, there are also separate files for each chapter in the folder called "Chaptered Stories". We used Lovecraft's own chapter divisions except for "The Dream-Quest of Unknown Kadath", which he wrote as one extremely long tale. We thank Reber Clark for his suggestions for breaking it into chapters. How did you decide who would read each story? Through the sedulous application of certain infinitely abstruse and daemoniac formulae. Can I make a YouTube video using your recordings? Although that sounds like fun, please don’t post these on the internet or make digital copies. If you really want to use excerpts in some project, write to us and let’s talk. What if I found a mistake in the recording? There are some errors that arose in the process of recording these stories — those are solely our fault and we apologize for them. We fixed the ones we could, but some of them we had to let stand. You do not need to write in and tell us about any imperfections you may find — we just hope you, Mr. Joshi, and Mr. Lovecraft will forgive us. Some thumb drives also have a few minor errors in their metadata, but we think we fixed those already. If you really want to point out a mistake you've found, here's where you can write to us. Who are all the people on the library card? A great many wonderful writers, artists, filmmakers and musicians have “borrowed” from Lovecraft over the years, and we thought it would be fun to give a nod to at least some of them. If your favorite is not included we hope you’ll forgive us: there was only so much room on the card. I downloaded the file and it says it's corrupt. What do I do? Some Windows users have reported having an issue unarchiving their download. We are currently running tests to see what the problem might be and will replace the ZIP file if needed. Meanwhile, Windows users report having success using WinRAR to unarchive the download. A free trial version of WinRAR is available at the foregoing link. If you continue to have trouble with the download and WinRAR doesn't help, please do write to us and we will do our best to solve the problem. Where is the final chapter of "The Dunwich Horror"? The final chapter of that story was omitted from the chapters folder on some of the first wave of thumb drives, and we sincerely apologize for that error. You can download it here. These are NOT dramatizations like our Dark Adventure Radio Theatre - rather, this is an audiobook of the original stories, in all-new, never-before-heard recordings. This collection spans his entire career from his earliest surviving works of childhood to stories completed shortly before his death. The stories were recorded at The Jungle Room studio in Glendale, CA. Our thanks to engineers Daniel Viafore, Jeff Stone, Julian Beeston, Taeghan Hagood, Ben Soldate and studio manager Kevin Anderson for risking their sanity in listening to us read for infinite hours.